Well hello there. Hi friend. I’m back. Considering how long it has taken me to read and review the last few books, I finished this one at warp speed, relatively. That may or may not have something to do with the fact that Lamentations was 5 chapters. As opposed to Jeremiah’s 52 and Isaiah’s 66. What can I say about Lamentations? Well, here’s what it has going for it, other than brevity: its name describes its subject matter to a T. This book is traditionally believed to be the lamentations of Jeremiah regarding the destruction of Jerusalem. Although according to Wiki, it’s no longer generally accepted that Jeremiah actually is the author. No matter. Point is, someone is sad about the destruction of Jerusalem and the people of Judah, and he is writing about it in the form of 5 poems (I say “he” because if the Bible has taught us nothing else, it’s that women are generally useless for anything other than bearing children and helping to clear the way for the men to take charge). 2:20 “Look, Lord, and consider: Whom have you ever treated like this? Should women eat their offspring, the children they have cared for? Should priest and prophet be killed in the sanctuary of the Lord? 2:21 “Young and old lie together in the dust of the streets; my young men and young women have fallen by the sword. You have slain them in the day of your anger; you have slaughtered them without pity. 3:1 I am the man who has seen affliction by the rod of the Lord’s wrath. 3:3 indeed, he has turned his hand against me again and again, all day long. 3:4 He has made my skin and my flesh grow old and has broken my bones. 3:5 He has besieged me and surrounded me with bitterness and hardship. 3:6 He has made me dwell in darkness like those long dead. 3:7 He has walled me in so I cannot escape; he has weighed me down with chains. 3:8 Even when I call out or cry for help, he shuts out my prayer. 3:9 He has barred my way with blocks of stone; he has made my paths crooked. 3:11 he dragged me from the path and mangled me and left me without help. 3:22 Because of the Lord’s great love we are not consumed, for his compassions never fail. 3:23 They are new every morning; great is your faithfulness. 3:26 it is good to wait quietly for the salvation of the Lord. 3:30 Let [a man] offer his cheek to one who would strike him, and let him be filled with disgrace. 3:31 For no one is cast off by the Lord forever. 3:32 Though he brings grief, he will show compassion, so great is his unfailing love. 3:33 For he does not willingly bring affliction or grief to anyone. 3:38 Is it not from the mouth of the Most High that both calamities and good things come? 3:39 Why should the living complain when punished for their sins? The Lord’s “great love”?? His “compassion”?? Really!? Uggh. This abusive relationship continues – “If I’ve told you once I’ve told you a thousand times, I’m only doing this for your own good!! <smack> <punch>”. And then after this stuff in chapter 3, chapter 4 is basically, “Yeah everything’s fucked up right now because God fucked us all up, but it’s o.k. because we just have to behave now and stop sinning, and then God will fix everything for us.” The last chapter is then a prayer to God to … do that – forgive the people of Judah and fix everything again. That’s Lamentations in a nutshell. And because it wouldn’t be a Bible book without the misogyny, chapter 1 has a good helping of that for us too. 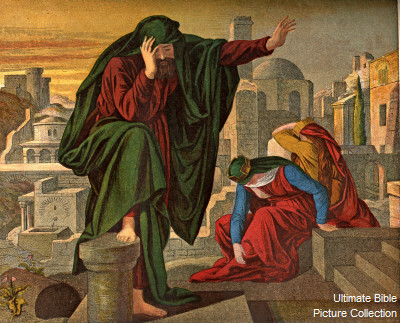 It compares Jerusalem to a sad weeping widow … and uses analogies involving the widow being seen naked, sexually violated, and, worst of all, menstruating (i.e. becoming unclean). GASP!! And we know from previous books how much God frowns upon menstruation. You can check out chapter 1 verses 8, 9, 10, and 17 to see what I’m referring to. So what grade shall I give Lamentations? On the bright side, it’s short. On the downside, there’s still plenty of (rehashed) murder and mayhem in here, and this book reverses the only thing it has going for it (the author questioning God for his murderer and destruction) by the second half of chapter 3. I’m giving Lamentations a 1 and that entire point is for brevity. I just can’t find anything else it has going for it. Plenty of people must find the author’s groveling to God and praise of God’s supposed “love” and “kindness” to be charming in some way, but I do not. And now here’s a major twist for the tragic – Just as I thought I was in the home stretch of the Old Testament, I came to the shocking and terrible realization that Ezekiel is 48 chapters. 48 chapters!! I thought we were done with these long books now guys!! When is this going to stop! ?